All work and no play makes Rispa a dull girl. Late to bed and early to rise, does not make her wise! I find myself buried under an avalanche of work. Which is not necessarily all in all a bad thing – far less time for gut-wrenching agonising. This post is really just not to fall behind on daily NaBloWriMo posts. The colours of those cabbages are fantastic. 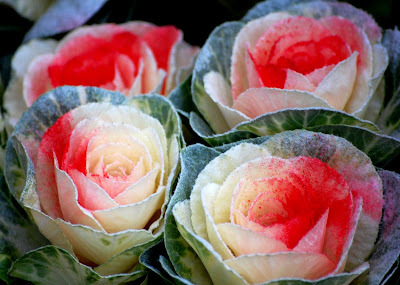 I like the fact that cabbages are seen as flowers today. One post a day for a whole month? Good luck - I wouldn't be able to keep it up! I saw the title to your post and thought, "how can she write dull with those beautiful flowers?" Hope they bring you inspiration and a smile! Oh wow! Such a beautiful photograph. I hope it helped to brighten your day a little.